We’re delighted to be working with Phoenix’s Jared & The Mill for the first time – plus guests Gintis! 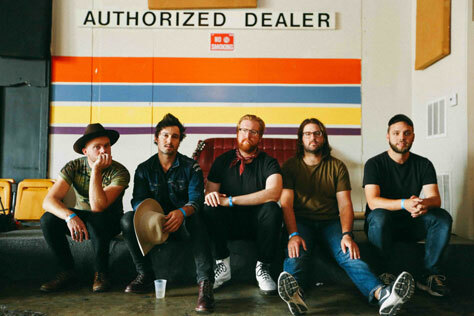 Jared & The Mill are a Southwestern indie rock band, formed in 2011 in Phoenix, AZ. The band has spent the past few years touring extensively through the venues, dives, theatres, festivals and arenas of the US and Canada, playing alongside new burgeoning bands and established acts, and developing a strong and rooted fan base along the way. The band has multiple and successful independent releases – the most recent of which, 2016’s Orme Dugas, was recorded and produced by Ryan Hewitt in Nashville, Tennessee. Support comes from Gintis. Formed in Abergele, North Wales when schoolmates Carl and Dave saw the video for Grandaddy’s The Crystal Lake and instantly bought their first keyboard from Cash Converters, Gintis are masters of being touchingly nostalgic, yet never cloying. Melodic, country-influenced brass-tinged melanchodelia, sprinkled with scientific rationalism and existential doubt, all wrapped up in breezy, understated three-minute ditties. The band’s acclaimed first album Idiots, Guides and Plans brought band a wide range of praise and subsequent radio airplay. Winners of a BBC Launchpad grant, Gintis are to release a double A-side 7-inch single through The Popty-Ping Recording Company, produced by Bill Ryder-Jones.